Online gambling is a fun pastime. A lot of people enjoy it, especially when they use Bitcoin. Bitcoin makes online gambling easier, with quick transactions and the lack of any need for additional information. All a Bitcoin gaming site needs is a wallet address, and person can start playing. The problem is that even if it is enjoyable to gamble online, it can still be dangerous. Gambling addiction is a well-known condition, especially for offline gamblers. It has resulted in a lot of ruined lives and empty bank accounts. Gambling online and using Bitcoin can make it more dangerous. The main risk of online gambling is that becoming addicted to it can go undetected for a long time. When a gambler becomes addicted offline, they have to visit a casino to indulge their addiction. This means other people will notice that they have been playing at a casino. For online gambling, there is no need to be physically at a casino. Players who cannot resist the urge to gamble have access to the online gambling sites anytime and anywhere. This means that it can be too late before someone’s attention can be called to the weird behavior. Another risk in online gambling is the access to funds. Offline gamblers have to make withdrawals from the bank if they want to get money for their gambling habit. With online gambling, people can access their bank accounts online. It is even more dangerous for those who gamble with Bitcoin. This is because bitcoins are completely online and they can be accessed easily and with no delays. A Bitcoin gambler suffering from addiction may empty his Bitcoin reserves without even noticing it. Finally, online gambling neutralizes the main defense that players have: the removal of the temptation to play. Offline gamblers can simply not go near a casino. With online Bitcoin gambling, starting to play again can be as easy as going online and signing up for an online casino. There are thousands of betting venues online and people can access them with a click of a mouse. If Bitcoin gamblers want to avoid the gambling addiction trap, the key is to set limits and have the discipline to abide by those limits. There are different limits every gambler should place on their selves. First, there are session limits. Gambling for only a certain amount of time can help in stopping addiction from developing. Second, there are deposit limits. It is simple enough to request a lock on a Bitcoin wallet or account that stops people from putting in more than a certain amount of money. Third, players should have loss limits. Losing too much can result in people trying to win back their losses. If a player loses a certain amount, then they should cut their losses and stop playing. 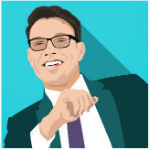 Bitcoin gambling offers great fun. However, people should acknowledge the risks that come with online gambling. 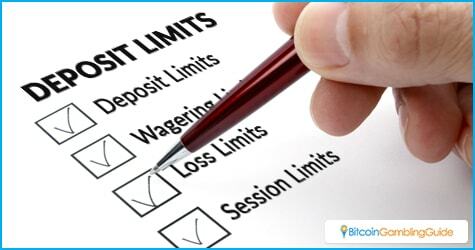 To play within the set limits is essential to ensure a safe Bitcoin gambling experience. 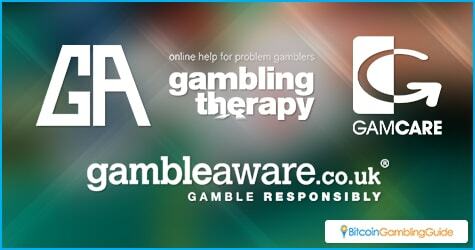 In the event that the players seek more help, it is comforting that several professional services that offer assistance are readily available, including Gambling Anonymous, Gambling Therapy, and GamCare, to name a few.